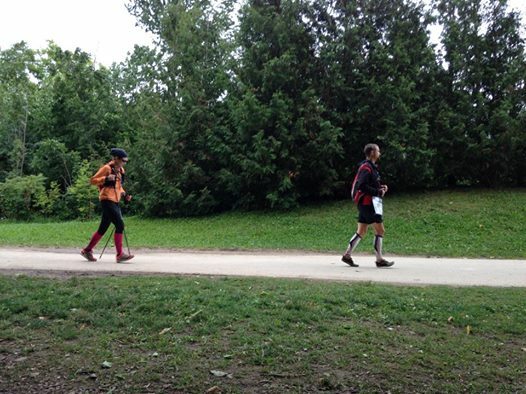 Back in August, I spent three days ‘guide running’ for Rhonda-Marie Avery; a legally blind runner who successfully ran Ontario’s 900 kilometer Bruce Trail, from end to end. 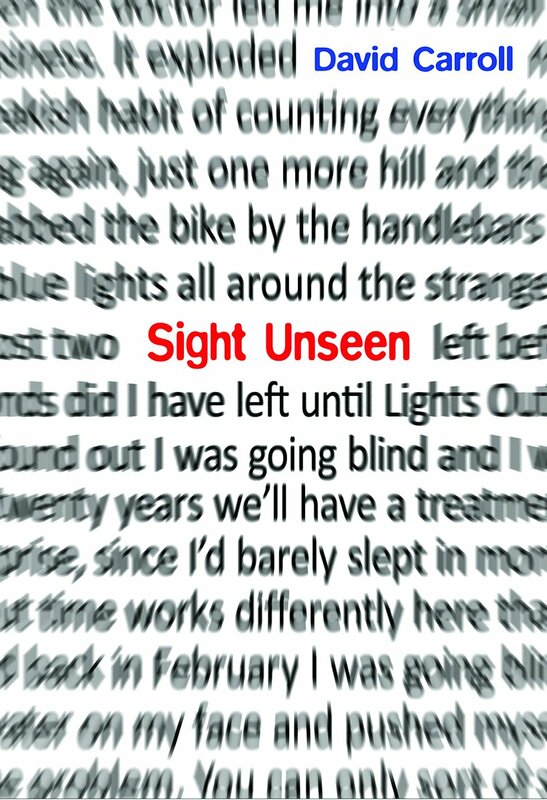 A documentary film crew followed Rhonda-Marie every step of the way – for twenty days. That documentary will be released later this year, but here’s a sneak peek of what happened on the trail. 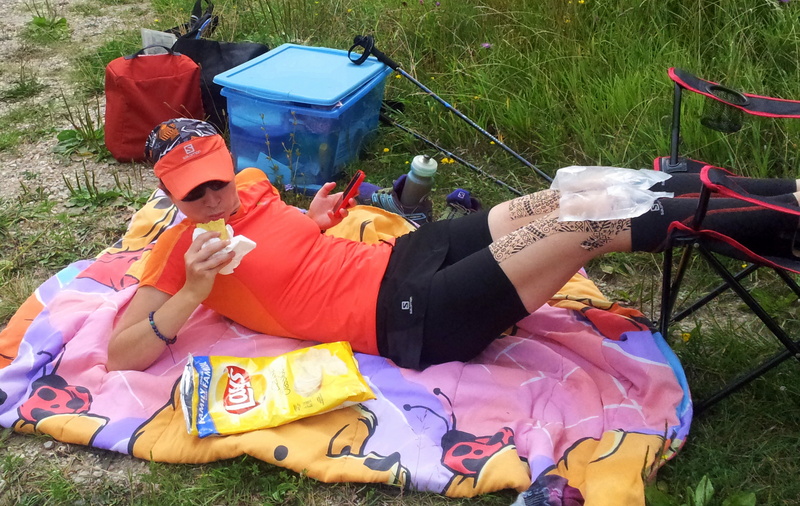 At this point in the story, Rhonda Marie has run 780 km. You can see eleven other ‘previews’ of the film, capturing all sorts of hijinx and heartbreak and, yes, twisted ankles. Just go here. 885 km. 20 days. 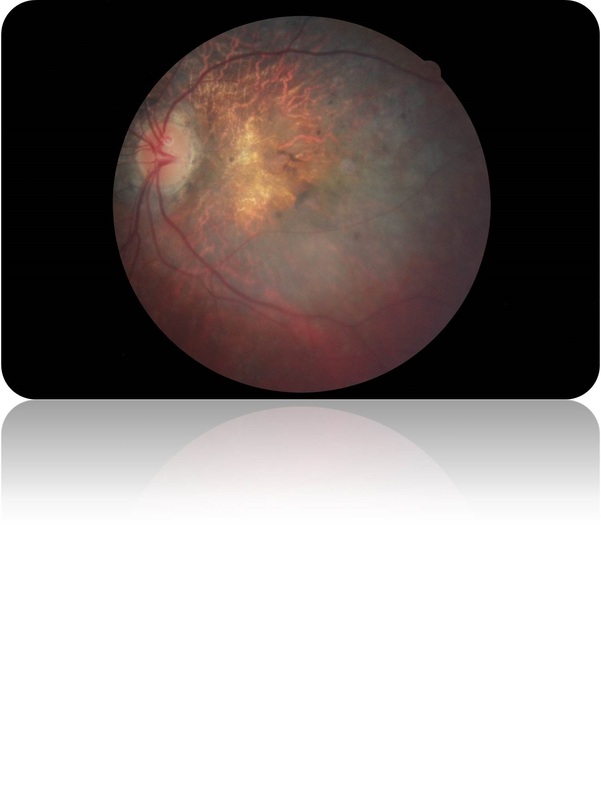 8% vision. 127 stiles, 1437 cliffs, one bear, dozens of snakes, 30,000+ feet of elevation gain, one twisted ankle. 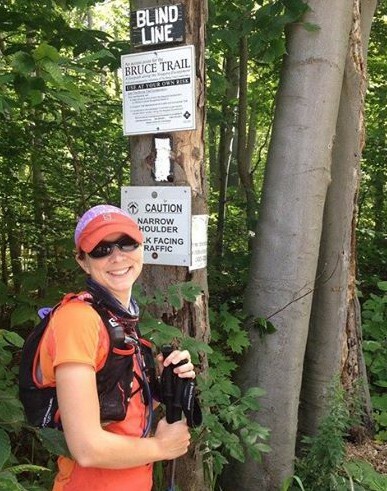 Rhonda-Marie Avery completed her end-to-end run of the Bruce Trail on Saturday afternoon, capping off one of Canada’s more extraordinary endurance runs. That’s Don Kuzenko; Rhonda-Marie’s tour manager. For twenty days he lived out of a van and served as Rhonda-Marie’s chief medical officer, driver, personal chef, personal shopper, life coach and head cheerleader. That dude deserves the Order of Canada. He probably got less than 100 hours of sleep over those twenty days. And yet he got Rhonda-Marie to the finish line right on schedule. That’s Cody Gillies; who holds the world record for the fastest end-to-end run of the Bruce Trail. According to Rhonda-Marie, it’s his fault she undertook this whole odyssey in the first place. During some of her darker moments on the trail, she referred to Cody as a “jerk.” Cody wasn’t remotely offended. Proof: he guided the Batgirl for five full days. Dozens came out to cheer for Rhonda-Marie at the finish. Some even joined her for the final sprint. 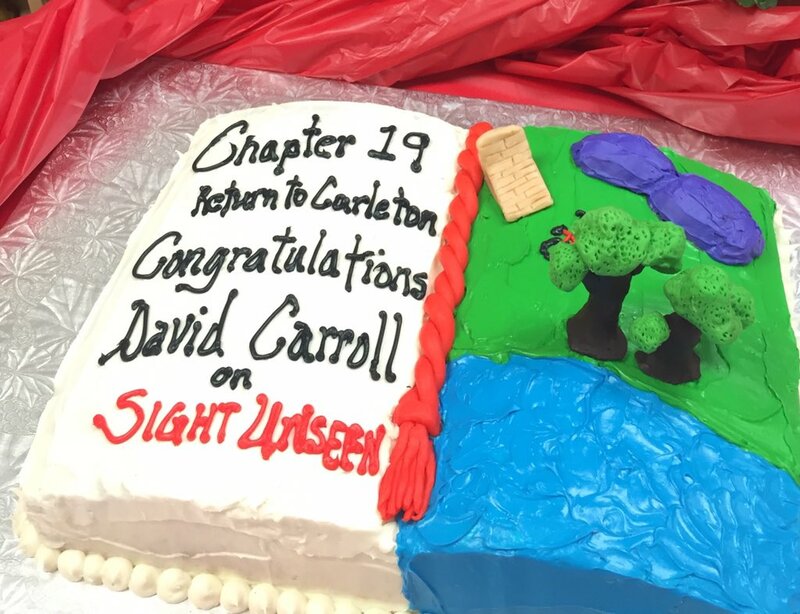 Afterwards, there were tears, speeches, cake. Rhonda-Marie grabbed her three kids and wouldn’t let them go. 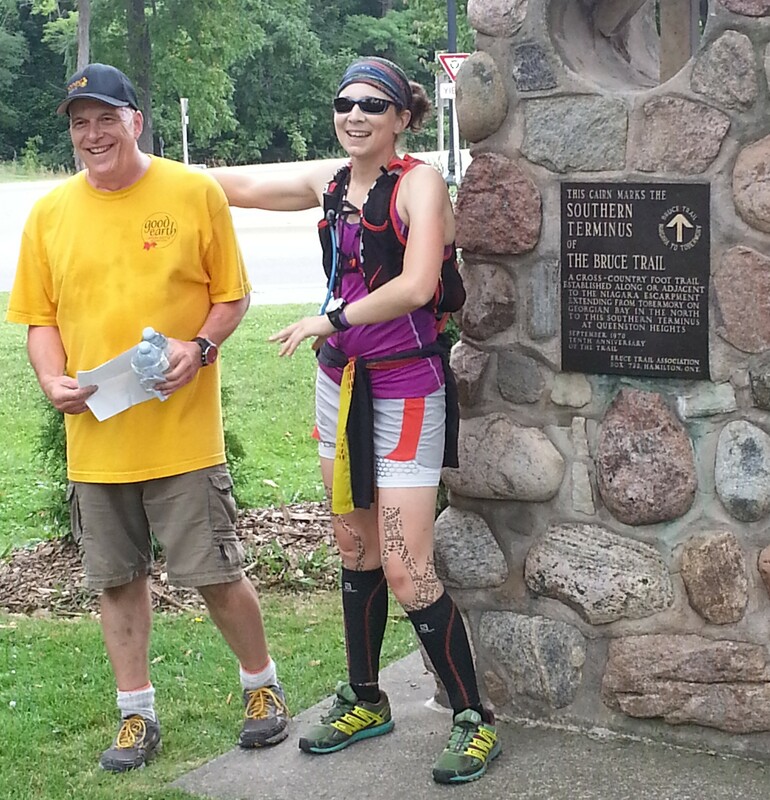 A Bruce Trail representative presented Rhonda-Marie with an end-to-end badge. The crowd cheered. Ronda-Marie sat down on the grass. The sun streamed through the trees and danced in blobs on the ground. Speckled sunlight. For Rhonda-Marie, that’s the worst possible kind. You can be a part of that community. 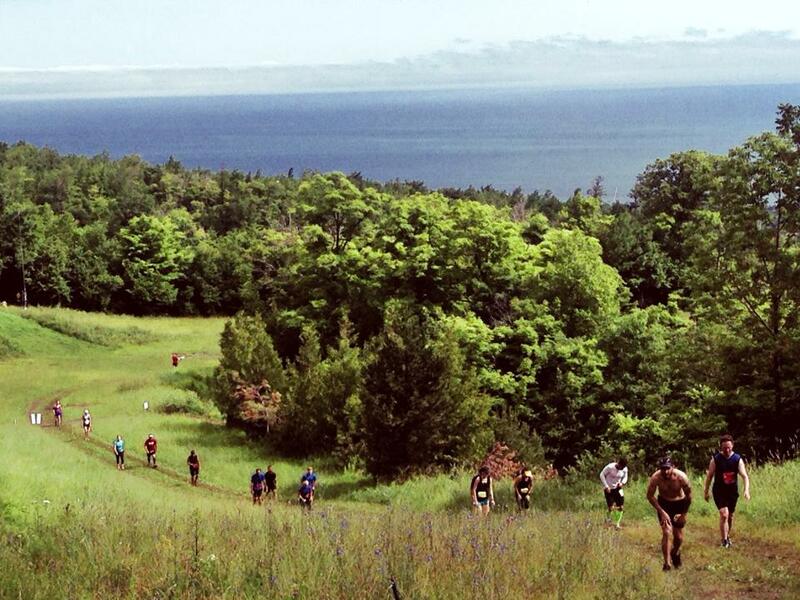 You can volunteer to be a guide runner here. Or you can make a pledge of support to Achilles Canada here. 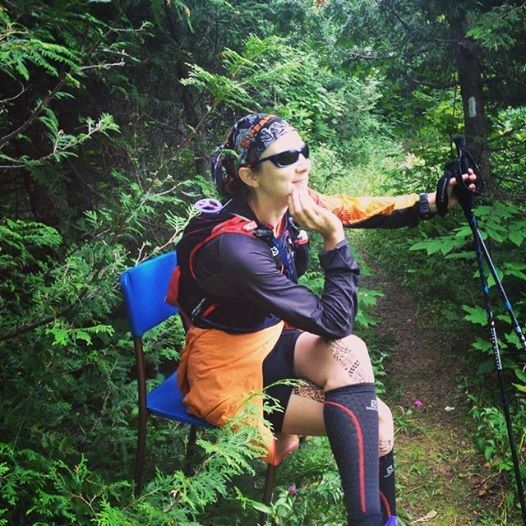 I need to update you on Rhonda-Marie Avery, the legally blind runner who is attempting to run the length of the 889 km Bruce Trail. I recently wrote about her in another post. 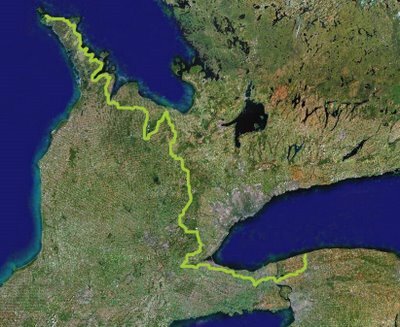 As I write these words, Rhonda-Marie is 72 km from completing her incredible journey. She will run 50 of those kilometers today, and the rest tomorrow. I was one of her guide-runners again yesterday. We were on the trail for 13 hours. 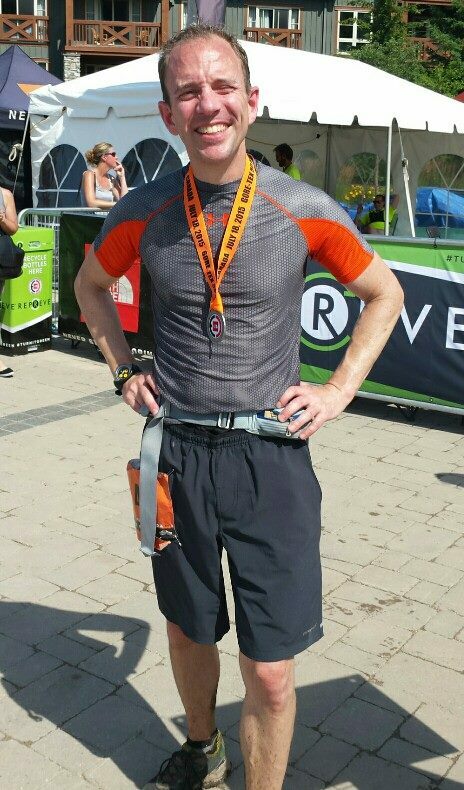 We ran from Hamilton to Beamsville. Somewhere along the way, Rhonda-Marie sprained her ankle. She didn’t yelp or cry out. I didn’t even know it had happened. There’s no stopping her though. After she’d had some food and a bit of rest, she started running again. 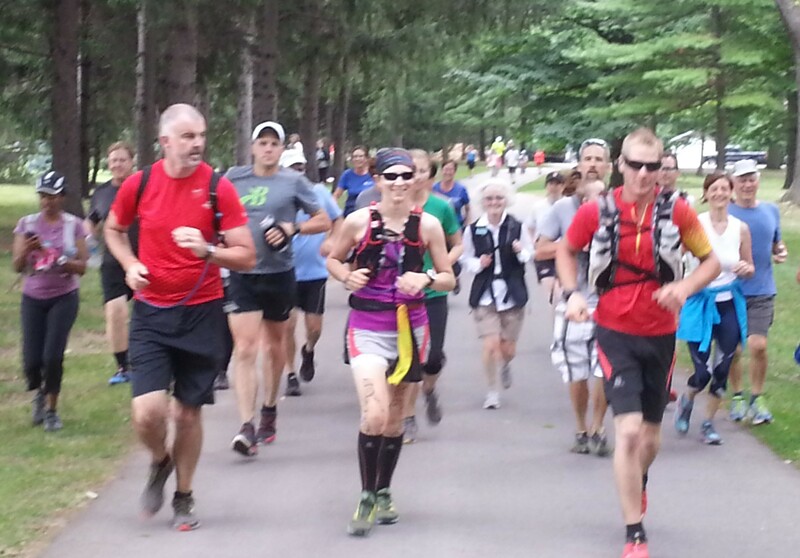 Right now, at 8:30 a.m. Friday August 22, Rhonda-Marie is running somewhere in the hills above Beamsville. She will finish her day near Brock University, in St. Catharines. And guess what. YOU are invited to join Rhonda-Marie for the final 5 km of her odyssey tomorrow (Saturday August 23rd). Rhonda-Marie is hoping that all sorts of people – especially people with disabilities – will come out to walk the final stretch. REPEAT: This will be a celebratory walk, not a run. 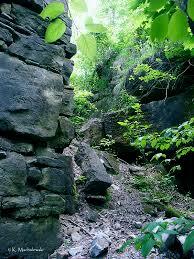 You’re invited to meet at Firemen’s Park in Niagara Falls at noon for the final hike to Queenston Heights. There will be tears, Advil and a LOT of laughs. 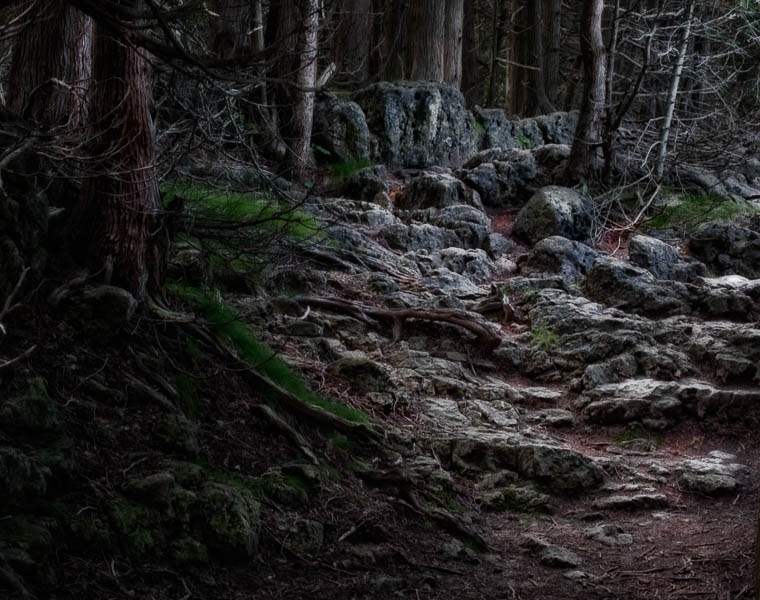 And when Rhonda-Marie finally reaches the end of the trail, she will kiss the final cairn, and peel off her shoes and socks for the delight of all. 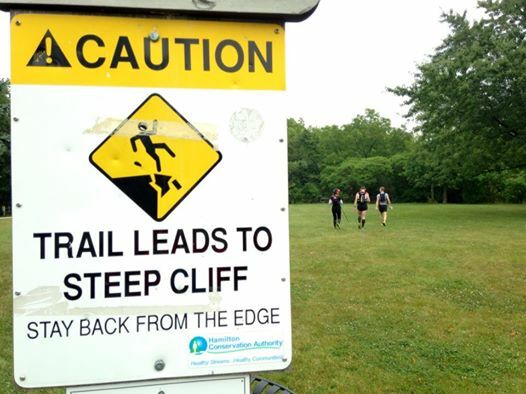 There are a lot of ways to die on the Bruce Trail. There are rattlesnakes and bears. 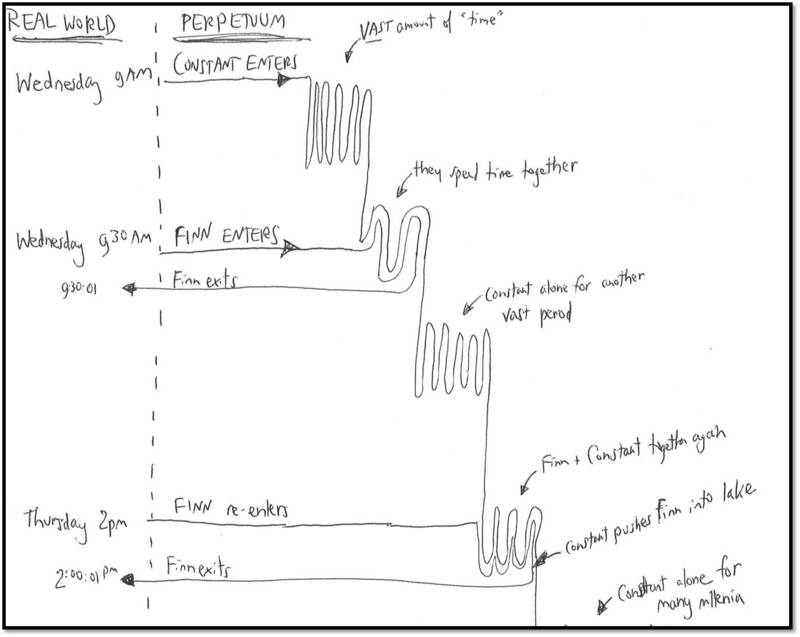 There are yawning crevasses. There are a billion slabs of jagged limestone, all waiting to split a runner’s head wide open. 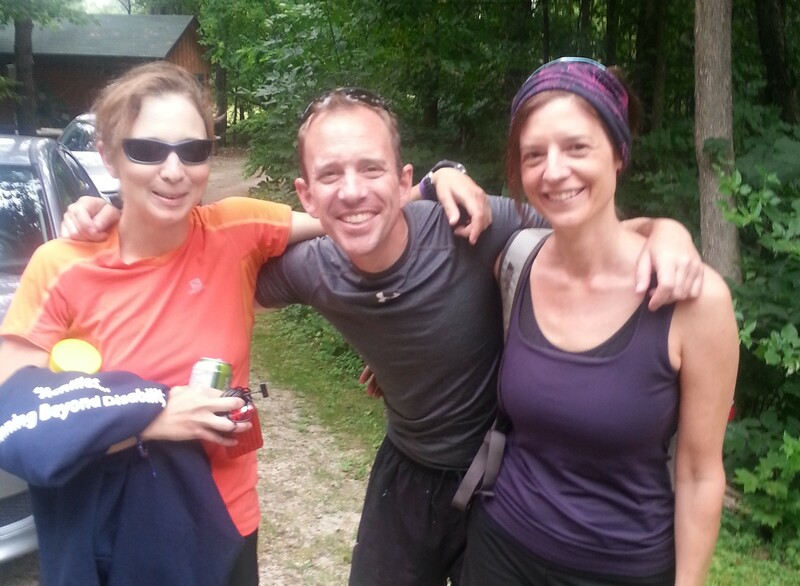 Rhonda-Marie Avery claims she was completely sober when she decided to run the 885 km Bruce Trail from end to end. She was minding her own business, drinking a cup of tea, when she heard a news story about a guy who’d set a new world record. 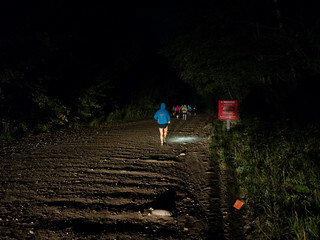 Cody Gillies of Orangeville, Ontario, had run the trail in just twelve-and-a-half days. And Rhonda thought, yeah so? As she drank that cup of orange pekoe tea, Rhonda-Marie decided to one-up the fire-fighter. Not only would she run the trail from end-to-end. She’d do it with only 8% vision. 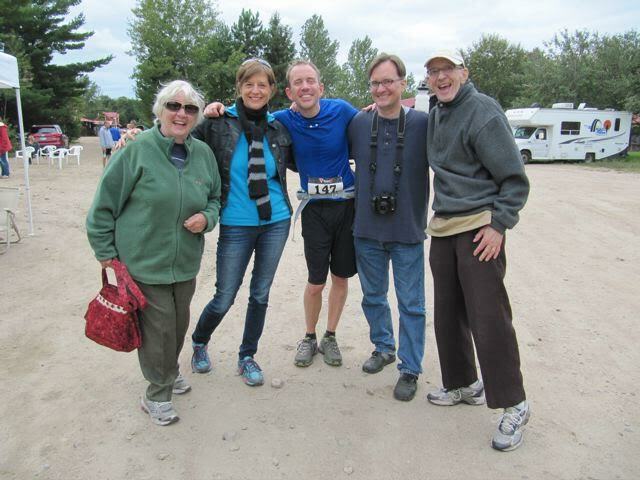 Five years ago, when Rhonda-Marie was first getting into running, she met with a group called Achilles Canada. Achilles paired her up with guide runners, and taught her how to run safely. Now Rhonda-Marie is returning the favour. This summer’s run is all about raising funds and awareness for Achilles. 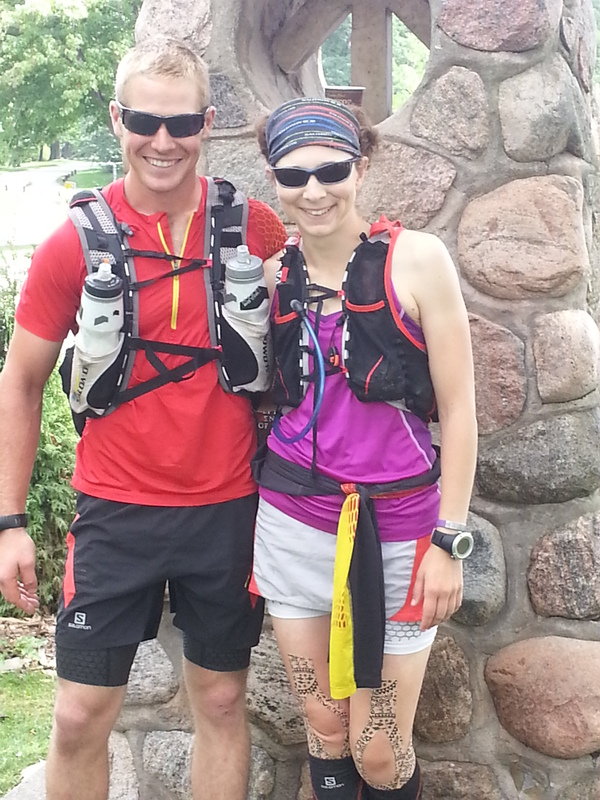 Rhonda-Marie began her run 12 days ago in Tobermory, Ontario. She’s running south to Niagara Falls. 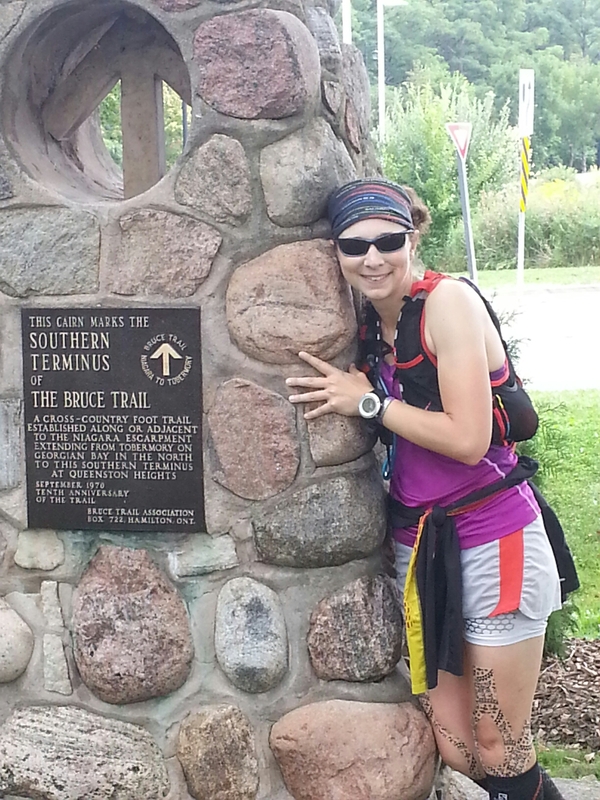 If all goes well, she’ll complete her run at noon on Saturday August 23rd. She’s right on track so far, having run more than 500 km. This language was developed collaboratively by Rhonda and her guides. It continues to grow and evolve. Recently, the term “gnocchi” was added to the lexicon. It means large, rounded, piles of rock. “Mashed potatoes” means muddy trail. “Scalloped potatoes” is mud with rocks and roots thrown in. A “chicken head” is a root sticking straight up. “Cheese Grater” is a pile of pitted limestone. 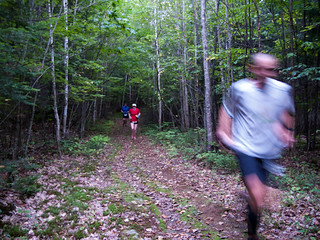 When the trail opens up and becomes smooth enough for running, that is called butterscotch pudding. 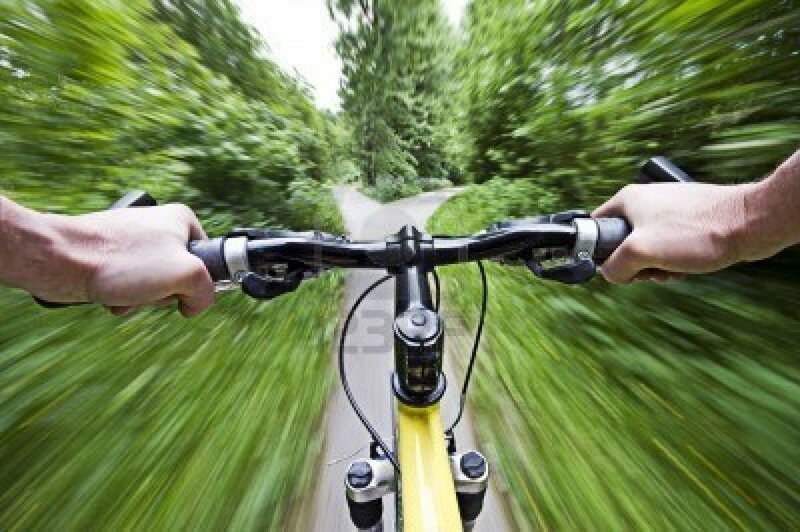 The most important phrase of all is “death to the left!” That gets used whenever oblivion comes within inches of the trail. Rhonda-Marie’s crew spent three days at my cabin near the Beaver Valley. It was like a friendly army had invaded. Don Kuzenko and Rhonda-Marie were there, plus a documentary film crew, led by filmmaker Lisa Lightbourn-Lay. Two volunteer guides appeared each day. Plus, assorted friends and family popped in and out. Most importantly, Scott Garrett, Rhonda-Marie’s partner was there. Scott helped cook meals and kept Rhonda-Marie laughing. Day Seven was tough. The team covered 42 km in brutal heat and full sun. One section of the trail was closed for maintenance, so we had to make a 4 km detour. 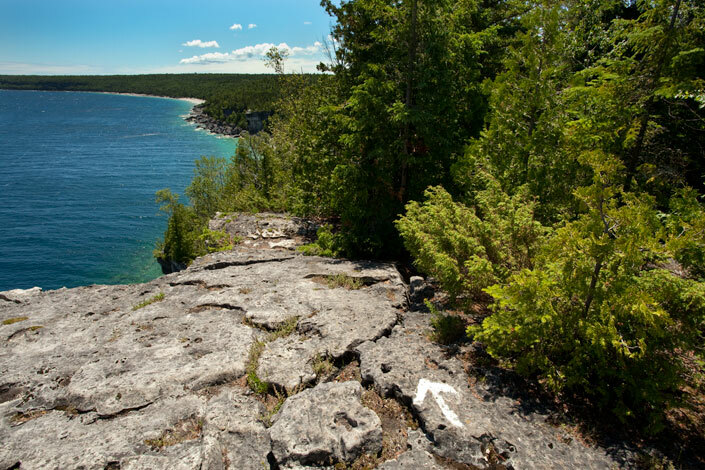 4 km may not sound like much, but on some stretches of this rugged trail, fully-sighted people are lucky to average 2 km/h. That little 4 km detour added 2 hours to Rhonda-Marie’s day. It was a brilliant thing to say, given Rhonda-Marie’s ebbing spirits. Generous too, considering the record she’d be eclipsing was his own. Sleep has been the biggest challenge so far. 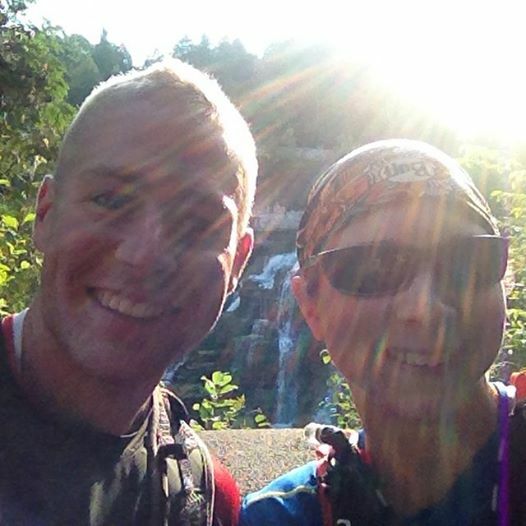 Rhonda-Marie’s daily runs are averaging 12-13 hours. When you add in meal breaks, travel time to and from the trail-heads, stretching, planning the next day’s route and meetings with the next day’s guides, she’s left with only 4 or 5 hours of sleep per night. And it’s a splintered sleep, since her muscles keep twitching after running all day long. Then there’s the pain. Rhonda’s feet are getting battered. Her knees are swollen. She takes ice baths each evening and tapes her legs every morning. I try to imagine what the pain must feel like. My best guess: giving birth to triplets while simultaneously having a root canal while your kitchen is being renovated and is going way over budget. But then there are the great moments. At the end of Saturday’s run, the crew headed back to the house. The shower was going non-stop. Rancid-smelling trail shoes littered the mudroom. The laundry room was a sea of toxic waste. For the first time on the tour, the whole crew ate together. Rhonda-Marie was in a good mood. Her partner Scott was there and so was Cody Gillies. There was a mountain of food: 10 pounds of vegetarian and non-vegetarian lasagna, veggie burgers, spring rolls, garlic bread, a colossal salad. For dessert, vanilla ice cream was scooped into bowls. 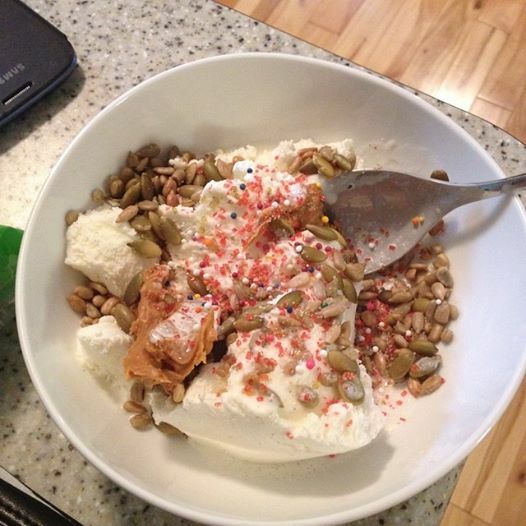 Rhonda added Wow Butter and pumpkin and sunflower seeds to hers. Candy sprinkles too. There were toasts and laughter and afterwards, hugs. Then, bit by bit, the house slipped into silence. 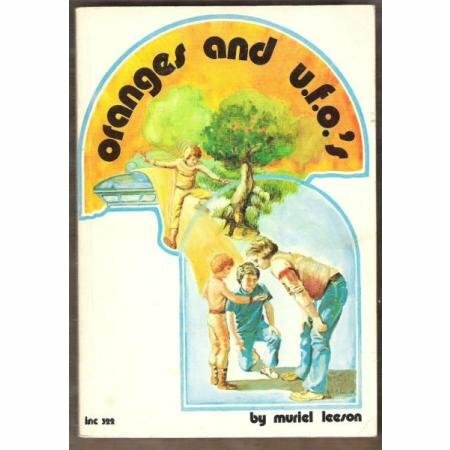 Don was the last to go to bed, studying maps until the wee hours and making the next day’s bacon-and-cheese sandwiches. 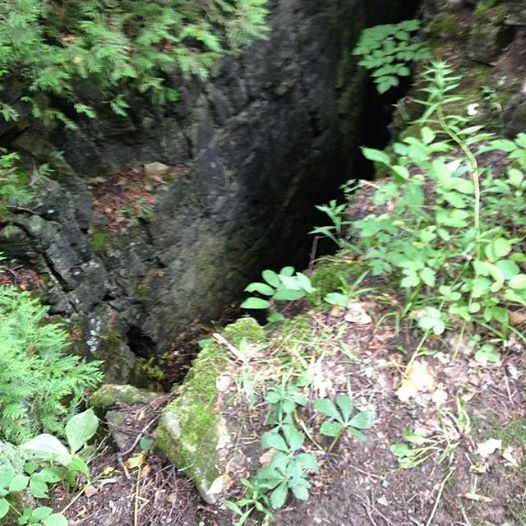 As I write this, Rhonda-Marie is somewhere near Singhampton 30 km north of Mono Centre, Ontario. She has run more than 550 km. I believe she will successfully complete this run. But she still has eight days to go. 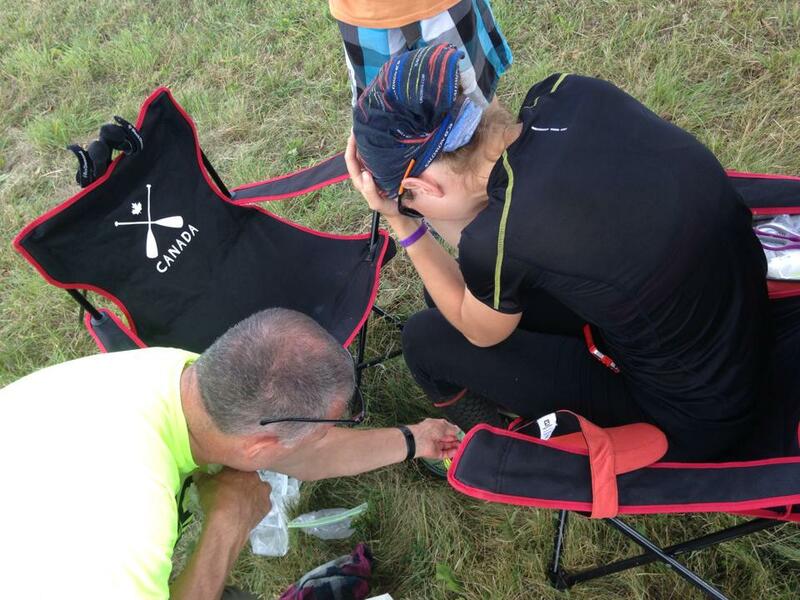 Eight days full of pain, sleep deprivation, and guide runners who Rhonda-Marie may or may not have run with before, and whom she must entrust with her life. You can follow Rhonda-Marie’s journey here. If you wish, you can make a pledge of support at GoFundMe. 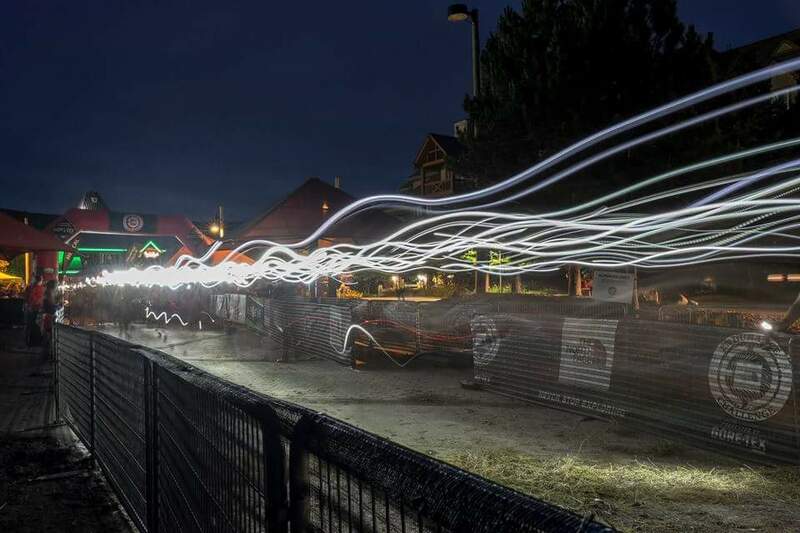 Money raised goes to support Achilles Canada, which connects disabled athletes with volunteers. Rhonda’s phone vibrates whenever someone makes a pledge. It totally boosts her spirits on the trail. I’ve seen it happen. Did I mention that I’m not in Boston right now? That I’m not running the fabled marathon, on this, the most emotional of years? 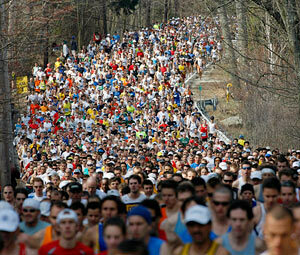 I’m thinking of my friends who are running the race. Not least Rhonda-Marie Avery, who I’ve written about before, and who was on the course last year when the bombing happened. Three Mile Island is a cement protrusion in the middle of Route 135 near Ashland. If you’re running in the middle of the pack, or drafting behind another competitor, it’s easy to miss the warning signs and pilons. Half the runners go right and the other half go left. If you’re not careful, you’ll smack into the cement wall. I grabbed his sleeve and yanked him out of harm’s way. “What was that?” Kai asked. “An early death,” I said. 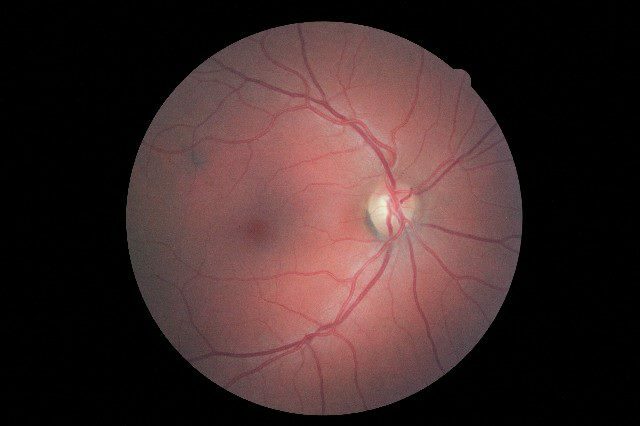 When Kai was still a teenager, macular degeneration robbed him of ninety percent of his central vision. Mercifully, the disease (called Stargardt’s) left his peripheral vision intact. 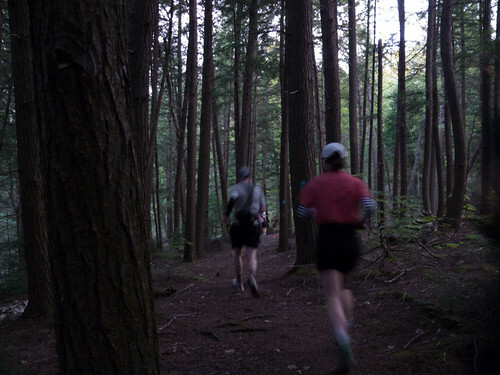 And it’s those twin curtains of sight that allow Kai to run with some degree of confidence – to deke left and right, and to find the gaps between other runners. Although he chose me to be his guide, Kai had no particular interest in being tethered to me by a rope. Nor was he interested in pinning a bright yellow BLIND RUNNER sign to the back of his jersey. “Thousands of cute Wellesley girls, and you want me to advertise that I’ve got a disability?” he said. 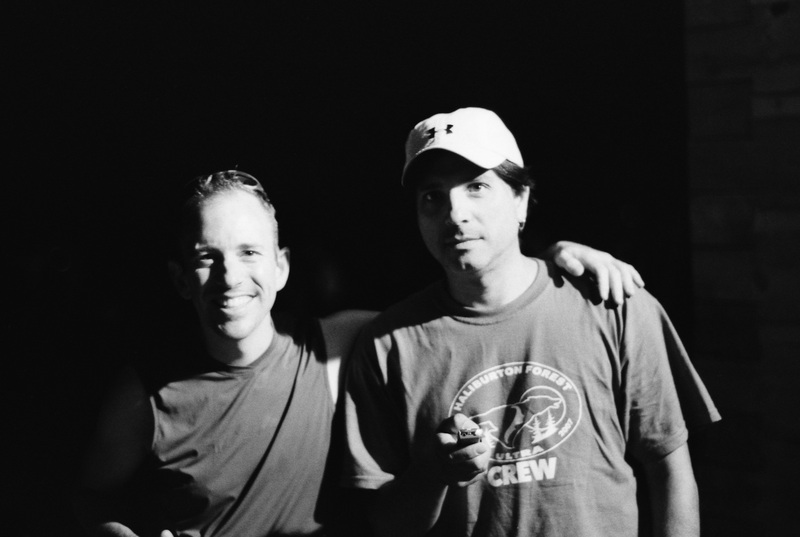 So there we were, two best friends, clipping along at a 3:50 pace. “Who’s that singing?” Kai asked me at the 10-mile mark. We could hear a karaoke version of Cracklin’ Rosie. “There’s a Neil Diamond impersonator standing on the roof of his El Dorado,” I said. Ten minutes later we heard intoxicated screaming. As we ran, it occurred to me that this was my true role as Kai’s guide: to animate the lunacy of the race for him. 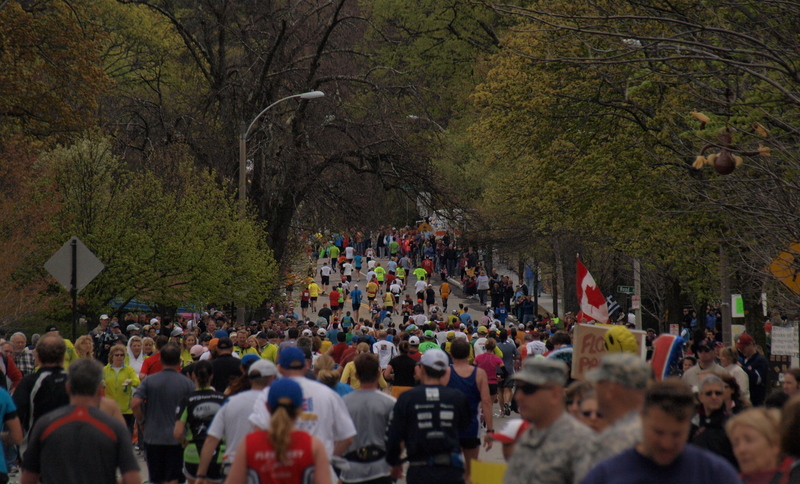 After all, running Boston is only half the fun. Watching the crazy people on the sidelines is almost as good. 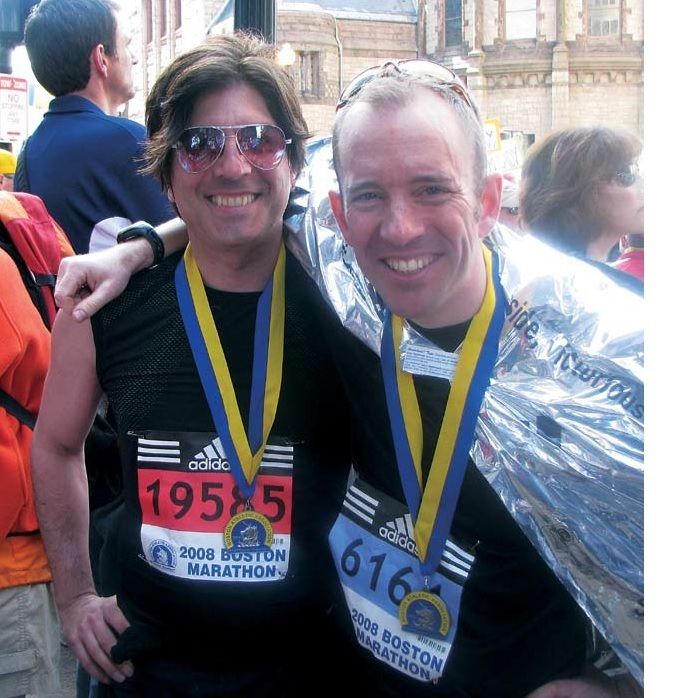 Before Boston, I’d run a hundred marathons for time, but in retrospect, I’d done those exclusively for myself. This was the first race where my eyes were fully open. 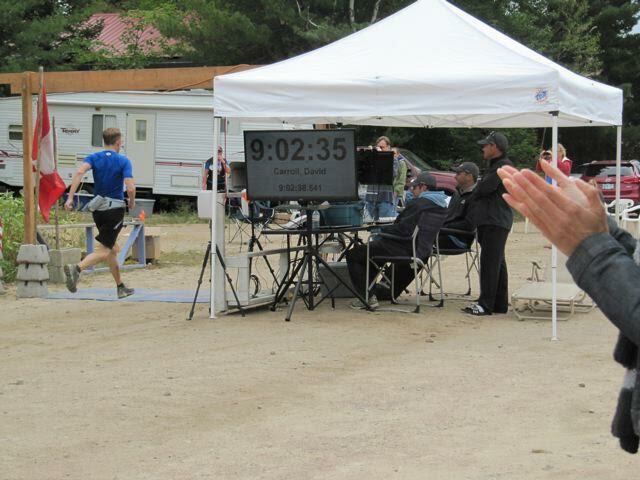 There is a photograph of Kai and I completing the race together. Our arms are raised, and we appear to be laughing. “Where’s the finish line?” Kai said. “Right behind you,” I said.